Albion, PA — Rogers Brothers Corporation recently completed a 125-ton capacity trailer for an iron ore mine in northern Canada. It is designed to haul machines weighing up to 125 tons. The trailer is 59' long and over 13' wide. Its running gear has 8 axles and a total of 32 tires to haul various types of mining equipment. This is just one of several very large trailers Rogers has recently designed and built for the mining industry in locations all over the world. This trailer is in use in a mine in the Province of Quebec moving a variety of the very large equipment commonly used in the mining industry. 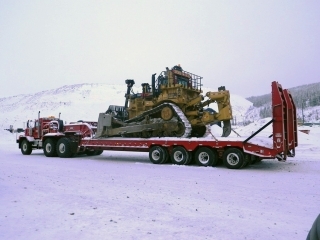 This ROGERS® 125-ton capacity trailer was built to haul mining equipment in Quebec.